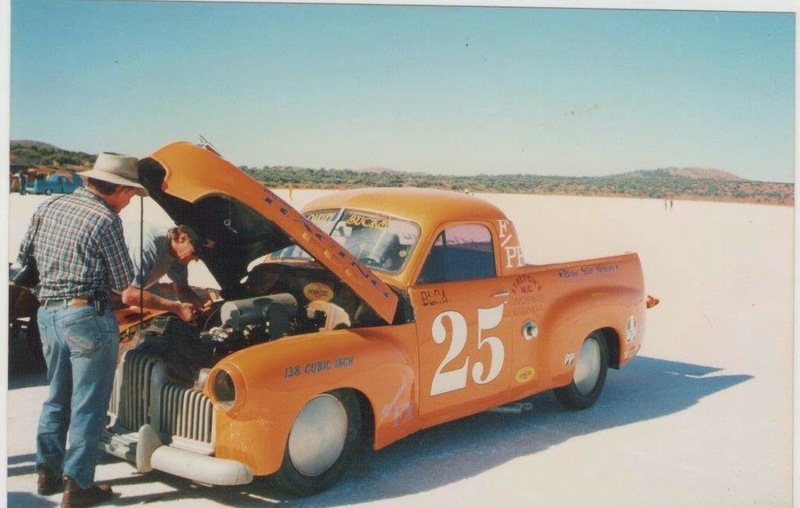 In 1993 Lindsay Wilson along with his crew Free Wilson ( Lindsay's son ) and his 2 best mates Peter Byron and Greg Dumesny, packed up the triple Stromberg powered FX and headed down to South Australia for see what sort of speeds he could pull. 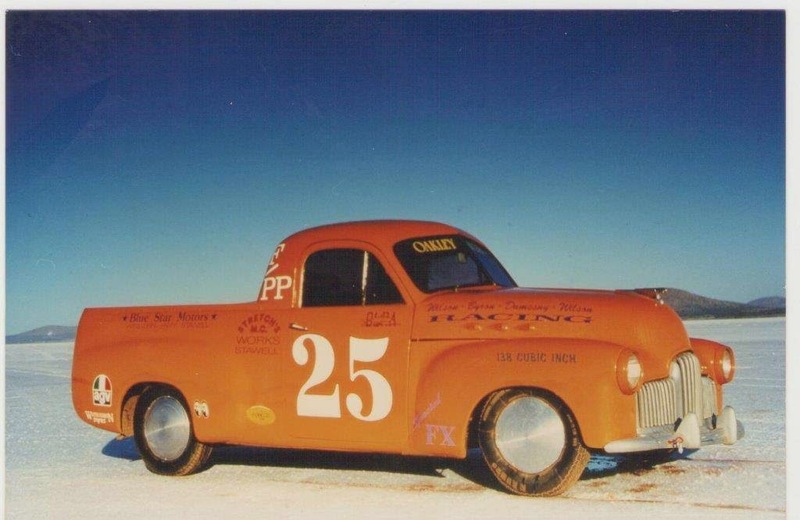 Lindsay is the #24th member of the Dry Lake racers, a founding member. Top speed was 109mph. "That high pitched howl that it gets at full noise makes the hair stand up on the back of my neck. It is a really long time to hold it flat!" said Lindsay, "109 + a little was the best but we didn't really chase the speed that much. We were still running a 3.89 diff centre! 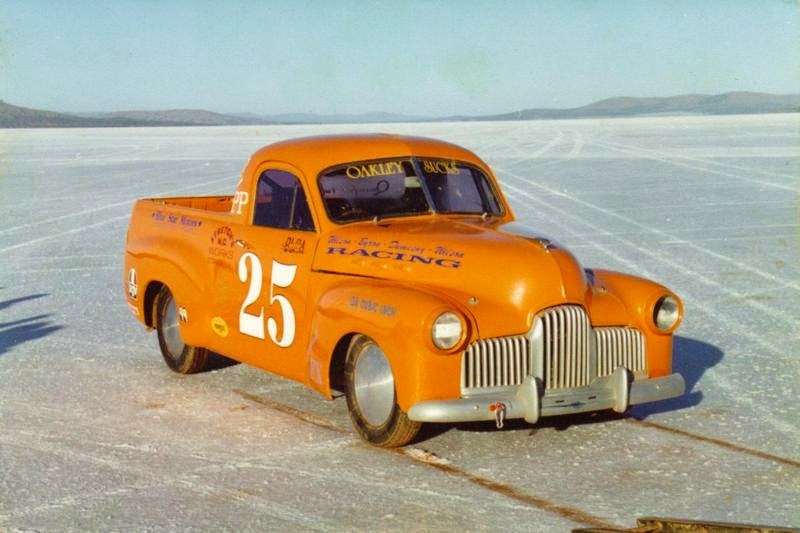 A Grey Power sedan ran a few years later and ended up with 113 mph I think but they did have an 8 mph tail wind. 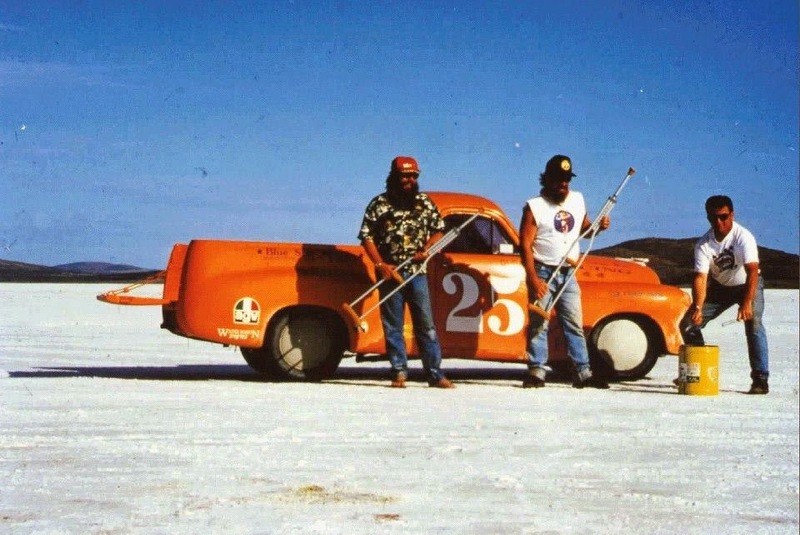 My ute was basically a standard ute with my good motor and the safety gear required." "Don't really know as we had a slight miss in it and thought that it might be electrical so the tacho was the first thing that got unhooked. You just hold it at full throttle in top gear and wait for the timing markers!" Lindsay still remembers the day and the car, stating "I can't make up my mind if I like it "camming" around idle or a full noise past the timers best. Both make me smile"
When asked about the existence of the FX ute Lindsay with a sigh replied "The only thing left is the running gear and the Left Hand front guard. I had a broken leg when we ran it the 1993 and it was hard to clean up when we got home so over the next 3 or 4 years rust set in. It was hard work pushing the clutch in with my crutch to get it of the line!!" Lindsays son went on to ride Lucky Kieser's 5 litre V-Twin at the lake when they were still trying to sort it. As a side interest Peter Byron & myself were both Bail Justices & J.P.s in Victoria at the time. Greg is a first cousin to Max Dumesny the speedway guy from a few years ago. We got the big speed at the next meeting as 1993 only had the short run-up due to water on the lake. Greg also owned one of the Z9's from Mad Max 1 ( The green & yellow one that does the mono up the main street in the movie ) and a later meet ran 141+ mph just as he rode it everyday to work, no fairing either! There is a photo somewhere of it in the back of the ute which is on the trailer at the lake. At an earlier meeting my son had run 117mph in there tow car!